Bristol, TN - VA Relocation Resources | Abingdon VA, Bristol VA, and Bristol TN Area Real Estate :: Highlands Realty, Inc.
We understand that relocating to a brand new area can be stressful! Not being familiar with the new area will have you frantically searching to find who to contact for certain things. Your real estate agent can be a great resource to guide you in the right direction while you get settled in the new area. Contact us for more information about Northeast Tennessee or Southwest Virginia. If you’re ready to move to the area, we will be happy to help with your home search in Bristol, TN – VA. If you’re thinking about moving or will soon be relocating to Bristol, TN – VA or the surrounding Southwest Virginia – Northeast Tennessee area in the near future, use this list of helpful resources to make your search of getting to know the area easier. Seven major interstate highways converge in Tennessee making Bristol, TN – VA a convenient place to live. Both cities offer local transit services to residents. The Bristol Tennessee Transit offers a fixed route service from M-F from 6:15 AM to 6 PM. Click to view the route map and more info. The City of Bristol, Virginia offers a fixed-route transit service with convenient pickup and drop-off points along the routes. Bristol, VA also has 3 buses operating 5 days a week covering more than 400 miles a day. Click for more info about the Bristol, VA route. Transfers are accepted between the two transits at the 800 block of State Street next to the Farmers Market. Commercial motorcoaches serving the area is Greyhound Bus Lines. Charter motorcoaches serving the area include 20th Century Coach, Inc., Green Coach Co, Inc., and Victory Coach Co., Inc. The Tri-Cities Regional Airport is the nearest airport. Freight rail service is provided to the area by CSX and Norfolk Southern. Bristol Virginia Public School System includes 4 elementary schools, a middle school, and a high school with a center for technology. Bristol Tennessee City Schools include 5 elementary schools, a middle school, and high school. In addition to the public schools, there are several private and parochial schools in Bristol. There are also multiple opportunities for higher education in Bristol including: King University and National Business College. Click for more information about Bristol, TN schools. Click for more information about Bristol, VA schools. According to areavibes.com Bristol, TN has a livability score of 70, which is better than 64% of areas. The area provides numerous parks and amenities that allows for great quality of life. The median home price in Bristol, TN is approximately $111,900. The lower cost of housing compared to other areas in the United States make the area appealing to many. Click for the complete livability report for Bristol, TN. Bristol, VA has been recognized in the top 10 medium VA cities in cost of living from areavibes.com. It has a livability ranking of 74, which is better than 80% of areas. The median home price in Bristol, VA is approximately $109,100. 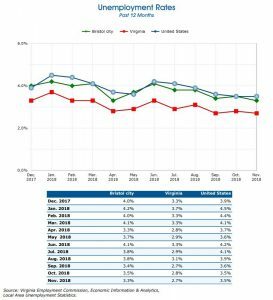 The cost of living is 19% lower than the Virginia average and 13% lower than the national average. Click for the complete livability report for Bristol, VA. The area’s lower cost of living and variety of opportunities to enjoy the outdoors make Bristol a top pick for calling the area home. Accommodation/food service, government, retail, and manufacturing are the top employment industries in Bristol, VA City. Click to read more about the community profile report from the Virginia Employment Commission. Health care/social assistance, manufacturing, accommodation/food service, and retail are the top employment industries in East TN. Click to learn more about employment statistics. The links below provide list of contact numbers and additional information you may have about Southwest Virginia or Northeast Tennessee.